TORONTO - The RCMP have busted a Canadian-wide prostitution ring that they say was operating with at least 500 Asian women smuggled into the country. “There could still be more. It’s still under investigation,” RCMP Corp. Francois Gagnon said Wednesday. The Mounties announced they had made six arrests over the last week in Project Confidence, disrupting the prostitution ring that officials say operated with two major cells in Toronto and Montreal. Police say the victims, who were mainly from China and Korea, were brought into Canada with visas obtained under false pretenses or over land crossings. Once in the country, the women were exploited by the ring at bawdy houses in Halifax, Montreal, Ottawa, Toronto, Winnipeg, Calgary, Edmonton and Vancouver. Gagnon said the victims were exploited for several weeks in one city and then moved to another. The accused are facing a number of charges including material benefit from sexual services, procuring, procuring persons under the age of 18, and advertising sexual services. The two alleged ring leaders in Toronto have been taken to Montreal to appear in court on Thursday. Those arrested in Montreal appeared in court earlier this week. 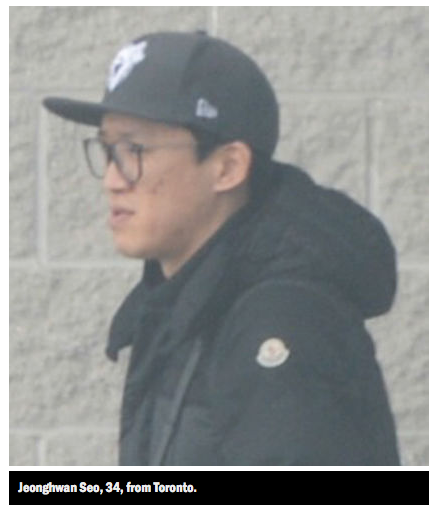 Accused from Toronto are Daegun Chun, 46, Ying Li, 31, and Jeonghwan Seo, 34. In the Montreal area, Kai Chen, 37, Nan Wu, 33, Le Yu, 38, and Anyang Cui, 26, are charged. Melanie Williams-Johnson, 20, from Montreal, is still sought. During raids on the operations, police seized computers, cellphones, vehicles and large sums of money. More charges will likely be laid, Mounties say.